Beautiful Cabin and Lake! Great for fishing and recreation . This cabin has 3 bedrooms, 2 baths, and a large deck that sits right next to the water. With a extra long dock with 3 benches. Perfect for catching fish off of. Sleeps up to 8. If you have a larger group look at vrbo #1099593. This cabin is only rented to one family at a time. The entire cabin is finished in pine and has a flat screen TV, and wireless internet. There is a separate rec room with a pool table, poker table, Foosball table, darts, and a 42" TV. Cabin is located on East Battle Lake, a 1900 acre lake with 9ft clarity known for its excellent fishing and boating. There is also a fish cleaning house, and a really nice dock, great for catching fish off of. 1) firewood- and chairs for sitting at fire/bag chairs. 7) Your own beach towels. Please leave bath towels in the cabins..
9) Paper plates/napkins baggies, tinfoil, garbage bags. We offer 2 Kayaks, 1 Paddle board, a paddle boat which seats 5, and a Lilly Pad which you can connect to the dock for the kids to play and jump on. All for an additional fee. Pontoon Boat Rental Is available thru outside sources. * Security Camera on the property. Located outside facing driveway. •	Sleeping is not allowed in the rec room. •	If raining or going to rain put the cushions for chairs in the storage container on side of cabin. The cushions for patio furniture and swing below are in the storage container on side of deck. •	Please do not bring the cushioned furniture by the fire. •	Do not grill within 10 ft of cabin. •	Please stay out of the garage and loft area over garage. •	Put garbage in the blue garbage bin. My family and I purchased this cabin in the spring of 2017. We have 3 kids, and love to spend as much time as we can at our cabin. 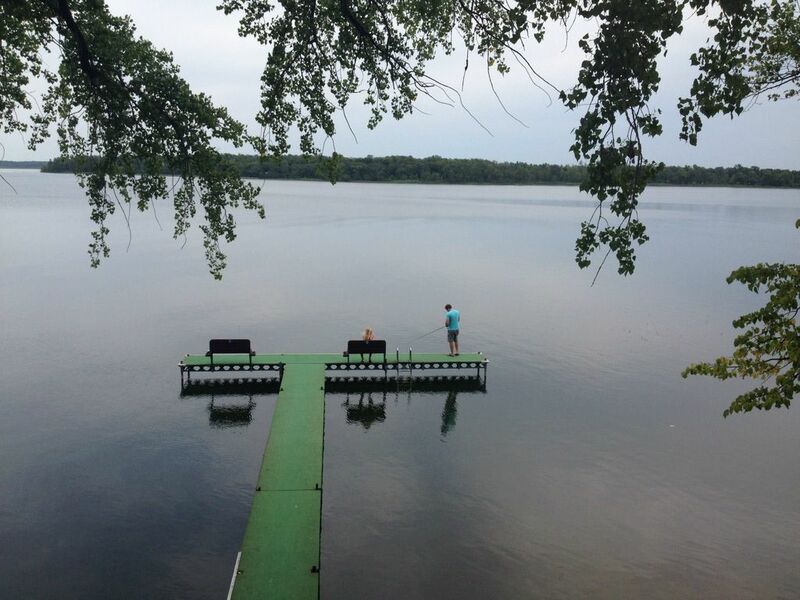 My kids love fishing off the dock catching a variety of fish, from sun fish, to bass, walleye and more! Our cabin sits in a bay area of the lake so is claim a lot of the time, which makes it perfect for kayaking, paddle boarding, or tubing. We have so much fun having fires at night, roasting hot-dogs, and smores, and listening to the loons. We are so happy that when we can not be at our cabin, other families can be! Thank you for your interest in our cabin, and we hope to have you as a guest! We have a rec room, offering pool table, Foosball table, gaming table, darts, and TV with Net flicks. For an additional fee we have kayaks, paddle board, paddle boat, Lilly pad. 2 bathrooms, each offers stand up shower. What a neat place! We had a great time and everything was as we expected it to be. We all loved the game room, especially on a couple rainy afternoons. Owners are v responsive to questions... we will be back for sure. Thanks!! Perfect lake location and space for the whole family! Too many wonderful things to list, but the main cabin had everything we needed - the laundry was an added bonus! Loved the large deck overlooking the lake. The loft area and guest cottage provided the extra space we needed for more family and everyone was able to gather together, but also had their own space. The dock and lake gathering area was perfect - we spent several days gathered down by the water, enjoying the kayaks, paddle board, fishing, swimming, etc. At night, the fire pit area was great for our bonfires and the kids enjoyed the swing and the space to run around, play games, etc. We also enjoyed having the use of the game room, playing cards and pool. Karry is very responsive and seemed to genuinely care about making sure we were comfortable and had everything we needed. Thank you so much! We cannot wait to come back!! It was so great to have your family at our cabin.. What we love most is the amount of room we have for large families to all come together! Hope to have you all again sometime! Awesome cabin,beautiful weather ,we couldn't have asked for a better experience. It was like a home away from home.The 1st day it felt like we belonged there.We started planning our nxt stay there before we left.The owners respond with in minutes of any questions we had ,thanks again for renting us cabin. Thank you for the great review. So glad you had a great week! We will be happy to have you back sometime soon! Very nice cabin to stay in . The deck is the favorite place to hang out over looking the lake in early mornings and evenings. The fishing isn’t bad either can catch a mix bag of fish. would like to come back again. Thanks for the great review! We look forward to having you back! Lots to do with in mins. Many good restaurants, golfing, ice cream shops, antique shops, and area lakes. You can rent boats, and water toys from a near by town.